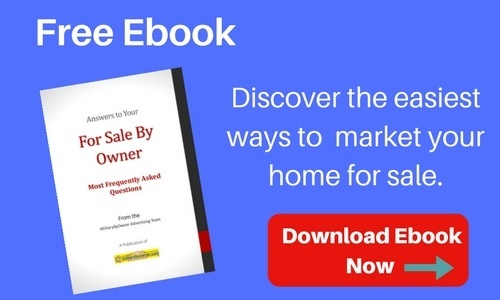 No, it’s not PCS season right now, and the holidays are quickly approaching, but if you’ve ever sold a home before, you know that preparing to sell a home takes time. But if you have a spring PCS coming, you’ll want to start making fixes around the house now. Some would argue that making repairs to your home before selling isn’t necessary, but the market should dictate how much fixing up your home needs. For example, if there are few houses on the market you might be able to get asking price with only a handful of repairs. But if buyers have many properties to choose from, you’ll want to make as many repairs as needed to remain competitive in the market. Just be sure that as you begin to make repairs before selling your home, you choose ones with a high return on investment. Some repairs aren’t up for debate. Ensure the property is structurally sound before listing your home for sale. Your home inspector will give you a more detailed list, but here are a few repairs you’ll need to look for. 1. Roof. You can replace worn and broken roof tiles yourself, but if there are holes, leaks, mold, or rotted wood, you’ll need to seek the help of a professional. 2. Leaks. If you have water damage to your ceiling or walls, you’ll need to look into a potential water leak and fix it. 3. Cracks. Cracks in the ceiling or walls indicate a larger issue with the foundation. Talk with your home inspector and determine which type of repair your foundation needs. Buyers not only want a pretty space, they’re looking for a clean, blank slate they can move into and make their own. These cosmetic repairs will help create that space they’re looking for. 4. Paint. Repair minor cracks, holes, and dings in the walls, and then apply a fresh coat of paint, include the ceilings! No one wants to buy a home that looks grimey. Applying a coat of neutral paint makes the home look well-cared for, clean, and fresh. 5. Flooring. Do you have carpet? Get it professionally cleaned or think about replacing the carpet altogether. Hardwood flooring can add value to your home, and many buyers today are looking for properties with hardwood. If you have hardwood flooring with excessive scratches, consider have them refinished. 6. Ceiling. You wouldn’t believe ceilings collect dust, but they do. If you have both ceiling fans and popcorn ceilings, then you know what I mean. We have two dogs, and I can’t tell you how many times I’ve brushed my ceiling to clear the dust. Save yourself the effort and replace them. 7. Cabinets. Replacing cabinets is expensive, so consider refinishing or painting them. Just like paint on the walls, refinishing your cabinets in the kitchen and bathrooms will freshen your look. 8. Hardware. It’s easy to overlook hardware since it’s small and understated, but it's easy to update knobs, handles, and pulls on cabinets and doors. This small fix will make your home look up to date. 9. Fixtures. Replacing light fixtures can get expensive, so you’ll need to be selective. You don’t need to rewire the electrical or install recessed lighting, but you should look around the house at your larger fixtures. Replace items like the dining room chandelier, ceiling lights/fans, and the entry way fixture. The exterior of your home makes the first impression, so investing a few dollars in repairs here will serve you well. 10. Landscaping. Keep your home looking well-cared for by replacing dead plants and trimming the grass. 11. Paint. The whole exterior may not need a new coat of paint, but maybe your trim, handrails, and shutters do. Look for any fading, weathered, or outdated paint and brush over with a neutral color. If the market is competitive and you have a flexible budget, there are a few more repairs you should consider making to your home. 12. Remodel. Kitchen and bathroom remodels are high on the "return on investment" list. If you have ability or budget, consider replacing the countertops, cabinetry, and appliances in these rooms. Although it wouldn’t always be in your best interest to do this, these updates may make your house stand out against the competition. Whether you're facing an off-season PCS or awaiting orders in the spring, these repairs provide a good starting point for you to get your house ready to sell. 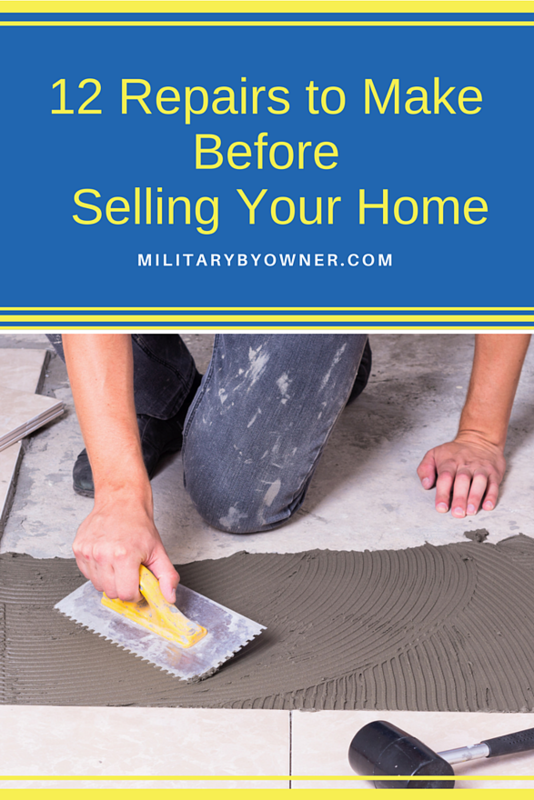 For more information about home sale prep, check out MilitaryByOwner’s library of free Home Selling ebooks.